Flexi-Tile Perfection Floor Tile Coin Patterns has raised circles and outer T-Joint Locking Tabs. Easy Do-It-Yourself installation, installs over many types of existing sub floors with very little or no floor preparation. Made from Virgin Polyvinyl that is carcinogen free material. Flexi-Tile Interlocking Tiles offer a luxury premium grade flooring solution for residential, commercial and industrial applications. The simplicity of the interlocking system makes installation quick and easy! A flexible, yet tough interlocking floor tile has been developed to provide an “instant” self laying floor surface, for use in a wide variety of applications. 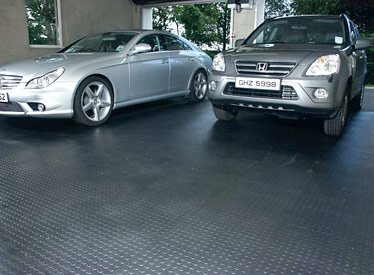 Residential uses such as garages, basements, mudrooms, kitchens, rooms and commercial uses such as office floors, stores, retail locations, restaurants, warehouses, military - anywhere a durable floor is needed. PVC tiles can withstand the toughest environment and weight conditions. The Perfection Floor tiles are also resistant to oil, petroleum, grease, anti-freeze and most chemicals. The original “jigsaw” profile is used on all four sides of the tiles and can be “locked” firmly together in a matter of seconds using only a rubber mallet. A complete floor can be laid, or lifted in a short time, without any need for expert labor or adhesives, thereby giving you significant savings in the total costs of a finished floor area. Easy to clean and maintain and last for years. Color Notice: Colors can vary in shade from web site image, and also from sample material. Production batch color shades can vary from different production runs. If adding to an existing project please call and speak to us about color matching options. It is highly recommended that you order enough material for your project in one order, as we sell high volumes of the grey it's very unlikely we will have the same dark grey batch a customer has ordered from. If you need assistance with tile quantities call our sales staff with your measurements. Center Tiles are 20.5" x 20.5"